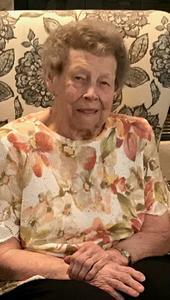 Loving mother, grandmother, sister and friend passed away November 29, 2018. Loretta was born March 22, 1928 in Grand Rapids to the late Roswell & Mildred (Johnson) Kelly. She was also preceded in death by her husband, Casimere Zeman; grandson Scott Dombrowski; siblings, Roswell Kelly, Jr., Rosemarie Heath, Wanda Fleet & Carl Kelly. Loretta is survived by her children, Cassie Osborne of Hudsonville, Nancee (Patrick) Sullivan of Allendale, David Zeman of Newaygo, Tom Zeman of Baldwin; 8 grandchildren; 15 great grandchildren; 1 great great grandson; and her twin sister, Loraine Szczepanek of Grand Rapids. She retired from Thierica Inc. after 20 years. Loretta will be remembered for her love of cooking and crocheting, but most important to her was her family. A memorial service will be held on December 1st at 11 AM at Heritage Life Story Funeral Home, 2120 Lake Michigan Drive NW. Friends may visit with family beginning at 10 AM. Interment is in Chapel Hill Memorial Gardens. Memorial donations may be made to Mel Trotter Ministries or Faith Hospice. Please visit Loretta's personal web page to leave a memory, condolence or sign the guest book at www.lifestorynet.com.